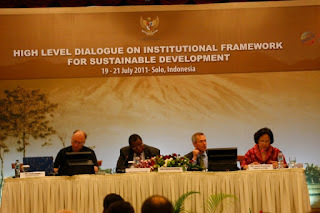 The high level dialogue on the Institutional Framework for Sustainable Development was organized by the Government of the Republic of Indonesia and the Rio+20 Secretariat and held in Solo, Indonesia, during 19-21 July, 2011. It was attended by most governments, UN Agencies and Programmes and some stakeholders. The purpose of the dialogue was to have a frank and open high-level discussions on the options for strengthening the institutional framework for sustainable development, with a view to progress towards formulating concrete proposals which could be taken up for consideration and possible adoption at Rio+20. Only know less than 11 months until the Rio Earth Summit and so much still to do. Some good developments new Brazlian head of FAO Graziano da Silva. Preparations for the Indonsian high level meeting on sustainable development governance. The first real chance to discuss reform of the UN CSD and national sustainable development governance. The UN DPI NGO Bonn 3-5th September Sustainable Socieities - Responsive Citizens Confernce will will be the big civil society conference on rio+20 which is looking at sustainable societies at all levels and will be the main stakeholder meeting prior to the november 1st deadline for contributions to the zero draft. If you are interested in havign an impact this is the event to attend!! !